Strange sounds in the Woods…..
It’s evening, and all of a sudden you hear this very strange sound on the hillside. It almost sounds like a baby crying, you get a little concerned, there it is again. We have only heard this sound a few times over the years and it can be a little scary at first, what is it? We have a pair of Eastern Screech Owls that have been here over 16 years, of course they are the next generation I am sure. They started nesting here when we built the Oak Cottage and have stayed with us all this time. The sound is one of their calls. Most of the time they make a cute little sound as the male calls for the female to come out of the nesting box to meet him. She being the good little wife, leaves the nest for their evening time together. We love the little owls and often Don calls them in to a nearby tree when we are sitting out on the deck. They fly right up to a close by tree branch and just sit and watch us. We enjoy the owls and their funny little head turnings. 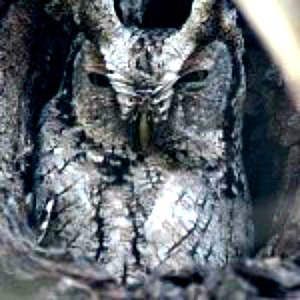 This entry was posted in Deb's Doodles and tagged birding, eastern screech owls by admin. Bookmark the permalink.